Guam is the largest and southernmost of the Mariana Islands, a 750 km-long archipelago along the boundary between the Philippine Sea and the Pacific Ocean. 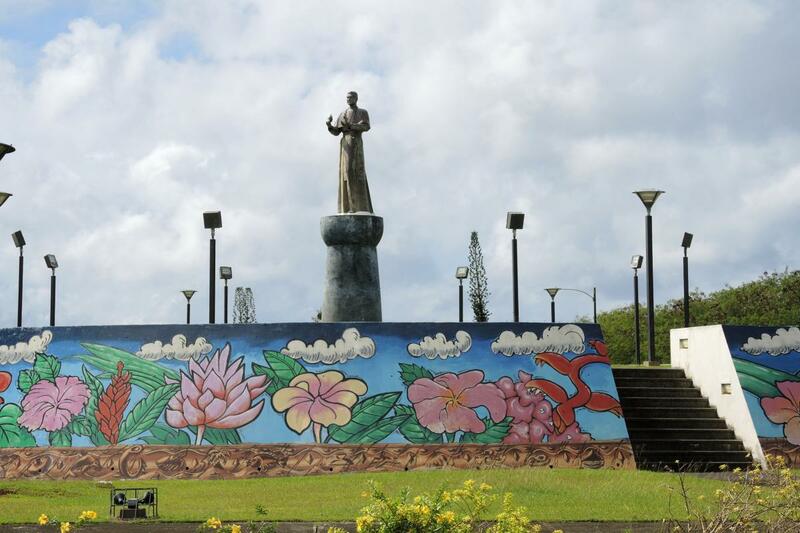 Island culture and local Catholic culture are shaped by the legacy of the Chamorro people, the original settlers; by 200 years of Spanish rule that linked Guam to the Philippines and Mexico; and by more than a century of American influence. There are no written records of ancient Chamorro society, but DNA and linguistic studies suggest that Chamorro culture was created by people who had migrated by sea, using remarkable long-distance sailing and navigational skills, from present-day Indonesia and the Philippines. The evidence available indicates that their culture differed from the peoples of the Micronesian islands to the south of them, but like those other islands, even though there were male chiefs, Chamorro life was organized matrilineally and matrilocally: family obligations were determined by the mother’s lineage, and men moved to the compounds of their wives.4 Clans, rather than individuals, owned property, which was passed down through the matrilineal line. Having claimed the islands more than a century earlier, Spaniards established a stopover base there in 1668 for the galleons that traveled between Mexico and the Philippines. Jesuits, supported by Mexican and Filipino lay missionaries and soldiers, brought the Catholic faith at the time. One of those Filipino laymen, Pedro Calungsod, was canonized in 2000. Americans gained control of the territories in 1898, following the Spanish-American War, and tried to Americanize the people by limiting “Spanish” Catholic practices. During World War II, Chamorro peoples were imprisoned during a violent occupation by the Japanese, who invaded immediately after Pearl Harbor. Chamorros still remember it — one recounted in an interview how her mother was beaten to death — even as Japanese tourists come today in large numbers. After World War II, nearly one third of the island was appropriated for United States naval and air force bases, and the island began to modernize significantly in the 1960s. Given the devastation of the war and typhoons, almost all of the pre-modern built environment is gone. Almost every building on the island was built after 1955, which gives a new feel to a very long-settled island. Given the long history of trade contact and occupation — much longer than other Micronesian islands further south — a good many of the particularities of pre-colonial Chamorro culture are lost or obscured. Spaniards preserved the Chamorro language, which over time drew on many Spanish words, but English is the dominant language today. Chamorro is still spoken by older people, including at some Sunday Masses, but younger people understand little and are taught in English. Many Chamorros have been working in recent decades to preserve Chamorro language and to recover Chamorro culture, even building a new museum to celebrate it. 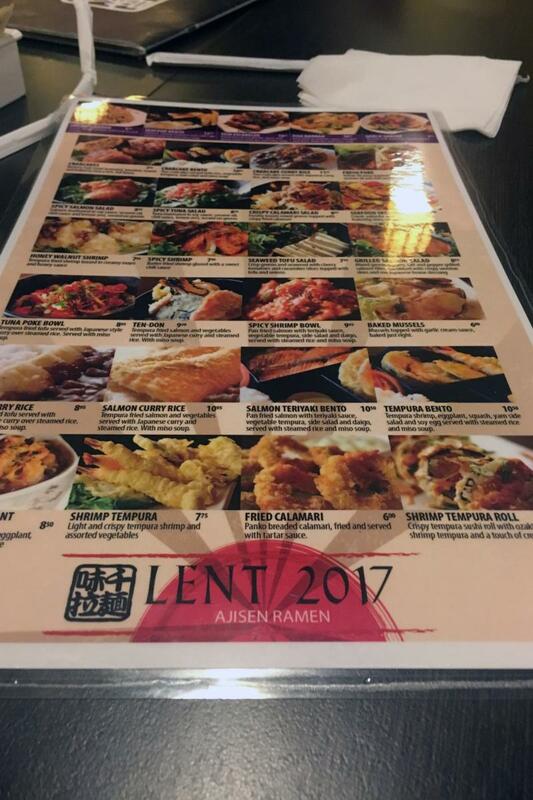 The church, conscious of Chamorro history, also tries to make Chamorro culture prominent even as the proportion of Chamorros diminishes due to in- and out-migration. In the 2010 census, 37% of the islanders identified as Chamorro, while 6% identified as Chamorro and something else. Filipinos constitute the second largest ethnic group, at 26% of the population.5 Filipinos, Micronesians and others are expected to some degree to adapt to Chamorro ways, or are given distinctive opportunities to celebrate in their own ways. For the Chamorros interviewed during this research, the “Chamorro” identity that they value is not some pre-colonial ideal, but an identity that builds on what they inherited from their grandparents and great-grandparents. They wanted to honor pre-colonial cultural ideals insofar as they could be identified or recovered, but they also recognized that Chamorro identity had drawn from Spanish, Mexican and Filipino cultural interaction.6 That history is told at the museum and is symbolically evident in the location for the museum — the heart of the old Spanish colonial settlement, immediately across from a statue of Pope John Paul II, diagonal from the cathedral and next to the Guam legislature, which faces the cathedral. To a remarkable degree, still, “Catholic” and “Chamorro” are significantly overlapping categories. Most interviewees describe Guam that as 80 or 85% Catholic today (Pew data cited on this page list it as 75% Catholic). Interviewees over 50 remember it as “99% Catholic” at one time.7 In reality, Protestant churches have been active for more than a century, but the memory, and the overestimation of the Catholic population today, probably speak to the overwhelming role of Catholicism in people’s lives. 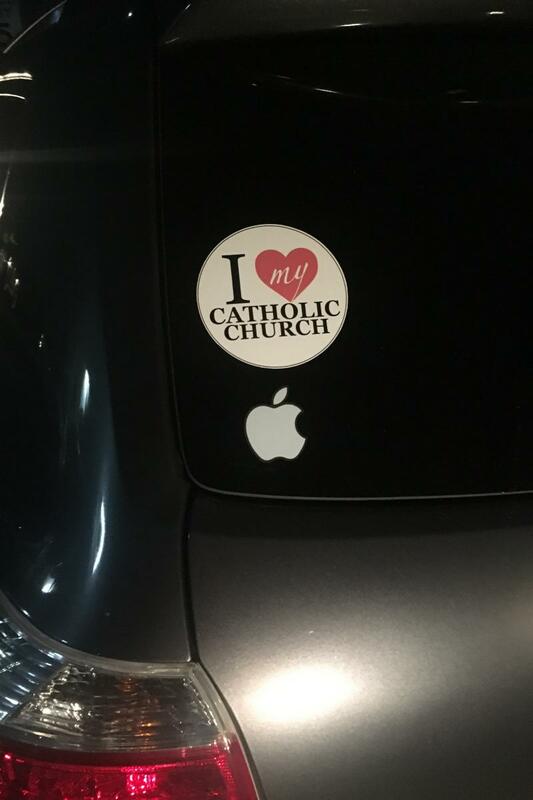 There are many other churches that proselytize on Guam, and certainly many weak Christians, interviewees claim, but not much express atheism. Parishes are half-full at weekly Masses, packed out the doors at Christmas, Easter and Ash Wednesday. 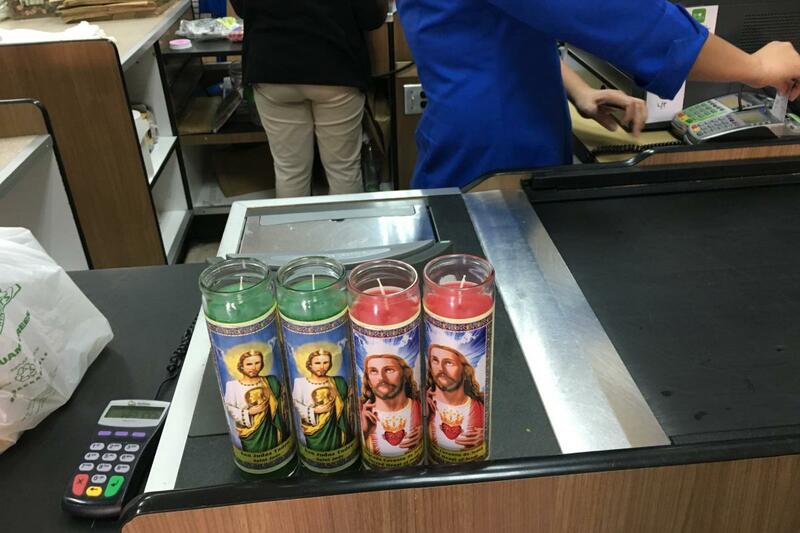 As one lay woman put it, there is a “bittersweet connection or relationship” between Catholic and Chamorro identity. “Chamorros will never deny that the way we define Chamorro today is very much infused with the way that we practice and celebrate our Catholicism. The Cross came with the sword, and that conquest always accompanied the presence of the Cross here on Guam anyway, and throughout the Pacific. At the same time, our people survived and thrived through their Catholic identities, so that's a very important part of our Catholicism today. It's so embedded in our cultural practice that you can't really separate what is Chamorro from what is Catholic. Even our language. It was the [Spanish] priests who documented the Chamorro language so that we were able to relearn it and perpetuate it.” It was the Americans, she said, who tried to obliterate the Chamorro language and culture. Several interviewees suggested that something of their pre-Christian religiosity lives side by side with Christianity insofar as many Chamorro people retain a sense that there is an invisible realm in their midst, partly peopled by saints, but also by spirits in the forest. Several older Catholics remembered being told never to relieve themselves in the forest without asking permission of the spirits, who could exact revenge for the disrespect. They still pass along those stories to children, mostly, they claim, to scare them in a light-hearted way. It is difficult to discern how broad or deep these beliefs run, given that people know that they conflict with being a “good” Catholic. People cite them as part of the particularity of their culture, but also largely deny that they are meaningful to Christians today. More significantly, people claimed that pre-Christian Chamorro culture endures in practices that link the living and the dead. 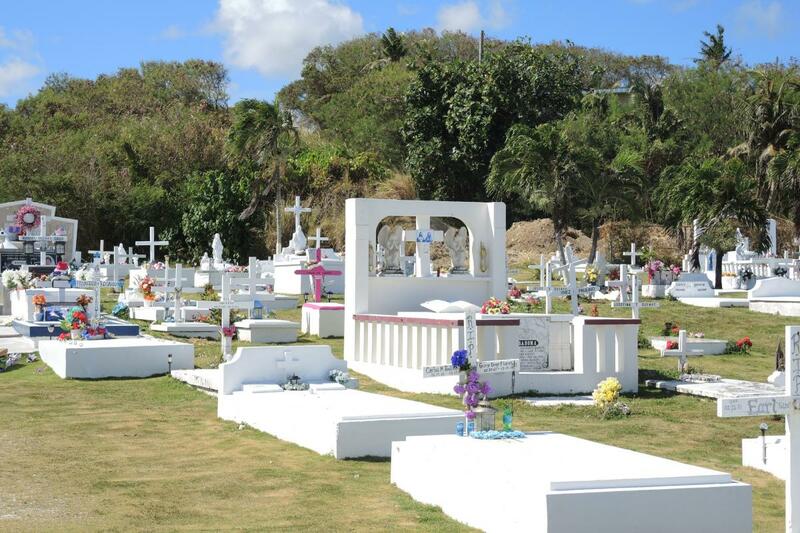 Attending funerals, showing respect for the dead, and keeping up cemeteries are described as non-negotiable Chamorro values. 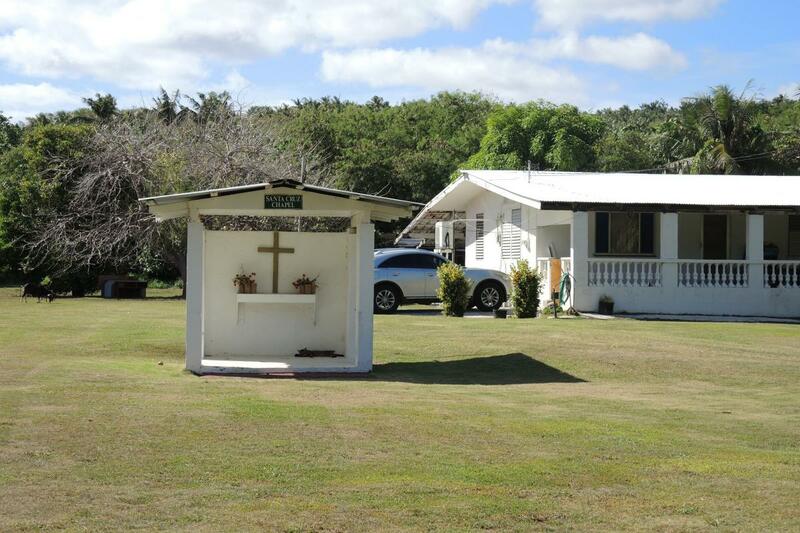 Chamorros no longer bury the dead below their houses as they did in pre-colonial times, but do pay special attention to honoring them. In interviews, two reference points were typically used to compare Guamanian practice: the Philippines and to the United States. 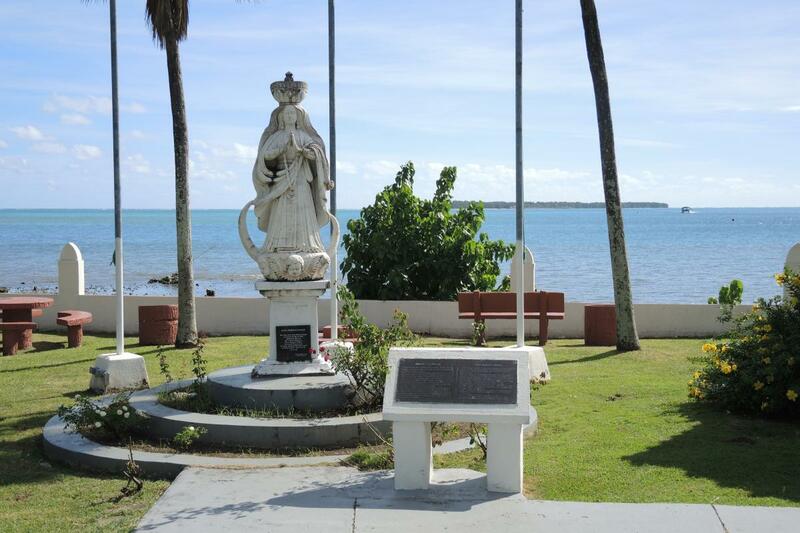 In fascinating ways Guam can still be thought of — in Catholic cultural terms — as a middle place on a cultural galleon route, today between the Philippines and the United States, rather than Mexico. 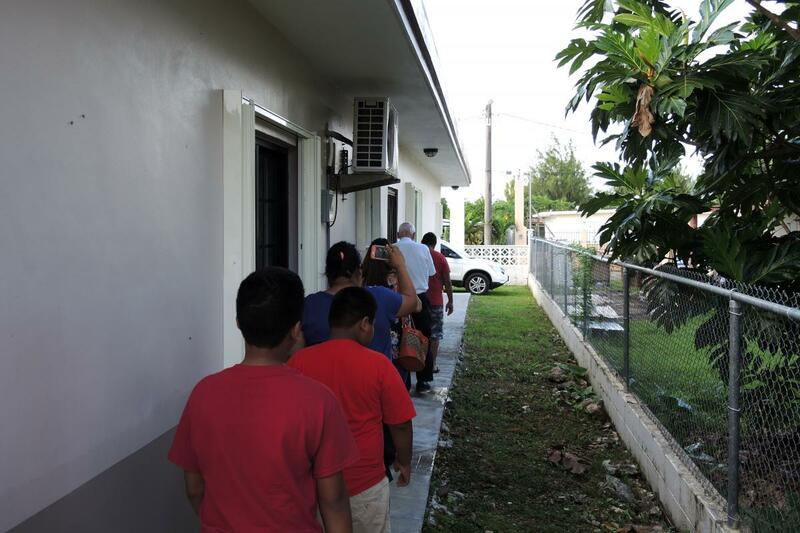 Of course Guam has its own identity, but given the amount of migration to and from those countries, ideas and values — and people, both clergy and laity — impact Guamanian life by offering competing cultural value frameworks and reference points. Some commonalities with the Philippines are easy for an American to recognize. 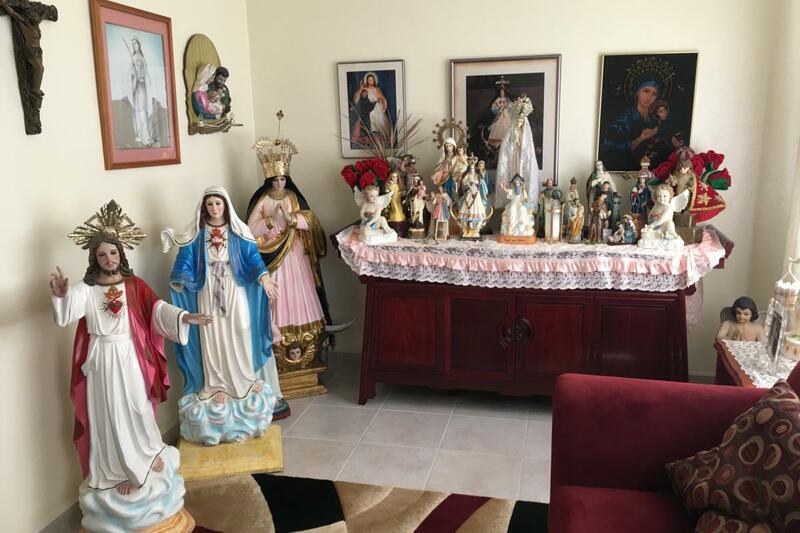 In Guam, as in the Philippines, religious statuary plays an important role in practice, including in people’s homes. 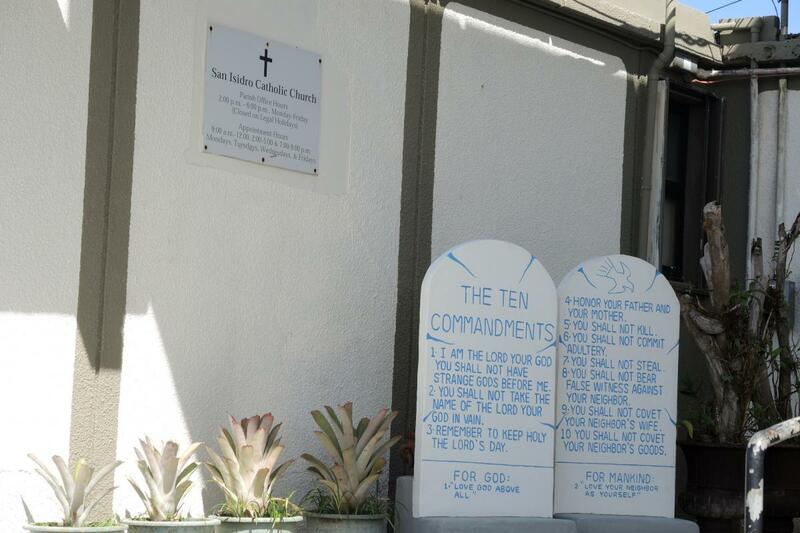 Like Filipinos, some Chamorro Catholics also find touch very important, including (albeit to a lesser degree) touching statues. 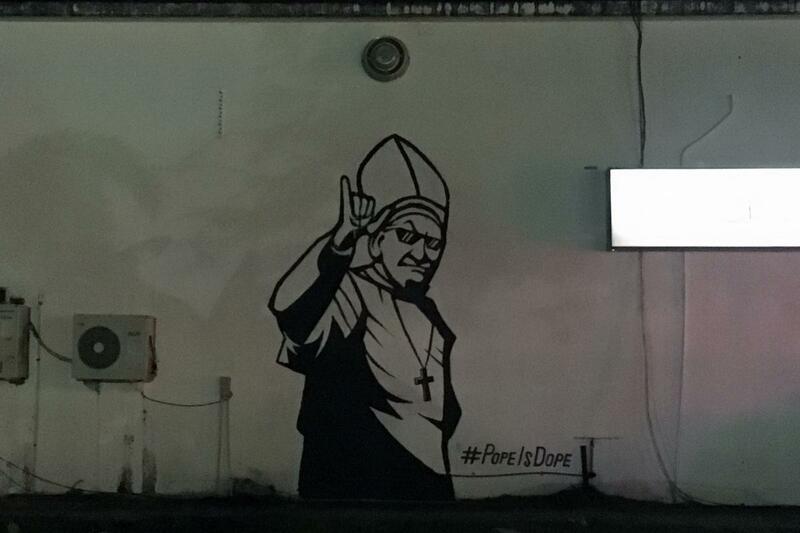 “Every time I go to a church, and I'm done praying I go up and I touch the saint,” one said. “When we pass a church, we make the sign of the Cross, and we talk to the patron of that particular church.” Similarly, feasts, particularly parish patronal feasts, play an important role in parish and island life. Each village/parish marks a major annual celebration of its patron saint with processions and celebrations, followed by big meals at home. These are advertised in the paper, and Catholics seemed aware of what feasts were held at what time of year, in what parishes. 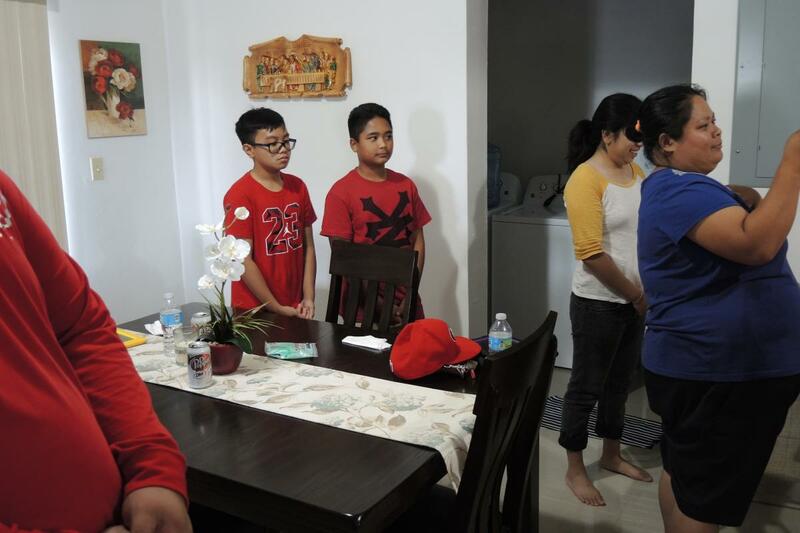 One interviewee thought it important to stress that Chamorro fervor is just as strong as Filipino fervor, though it doesn’t show the same way because in Guam, “we don’t have the huge numbers. We’re only 170,000 people, not 90 million. But we do have intensity on a smaller scale. Not some of the extremes like you see there, but parallel traditions like Santo Entierro on Good Friday,” when Jesus’ body is laid out for the Holy Burial. “Just as we would be going to a person's funeral whom we love, we come to Jesus' funeral.” On Good Friday a small crowd climbs Mount Jumullong Manglo, including a group of men who carry a large wooden cross to its summit, stopping at Stations of the Cross along the way. “Respectful, not ostentatious,” is the ideal, another reported. “Kneeling is important because it shows sacrifice,” she said, but further mortification, anything ostentatious, is looked down upon. Because Guam is a U.S. territory, with U.S. military bases, the influence of the United States is visible at every turn. Several people saw the intense commercialism that has overtaken Christmas on the island, and the ubiquity of Santa Claus as the symbol of the day, and the perspective that “Christmas is about children and presents” as evidence of American influence. Many people still pray the traditional nobenan Niño (novena of the Child) around a crèche at home, either from December 16-24 or between Christmas and Three Kings Day. But December 25, rather than Three Kings’ Day, is the day for celebration and gift giving. One important way that United States values seem not to have changed Chamorro ones concerns attitudes toward death and remembering the dead. One form of promesa, called an intrega in Chamorro, is a multi-generational legacy. Intregas are passed on from one generation to the next in families, as was one woman’s promesa to host a family nobenan Niño, the Christmas novena. According to this woman, her grandmother had passed it to her. One family even claims to have carried out a multigenerational intrega since the 17th century. 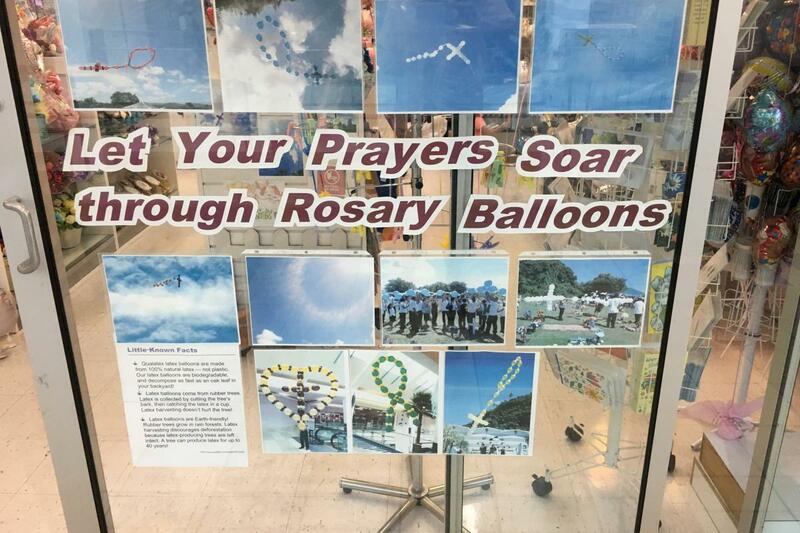 Clearly promesas and intregas have a powerful capacity not only to connect a person to Mary and the saints, but to connect families at home and intergenerationally. 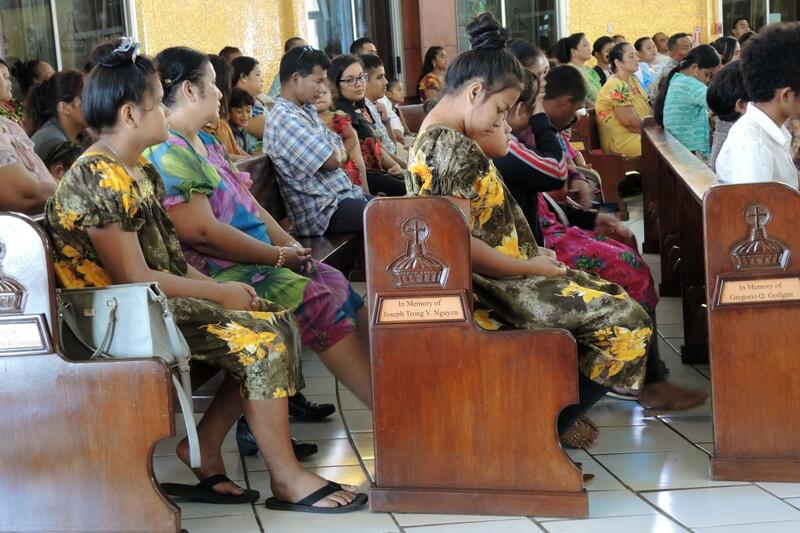 Intergenerational, long-term commitments (and the Chamorro matrilineal legacy) are also manifest in the role and status assigned to techas (pronounced tet-zas), women charged with leading prayer, primarily novenas, on particular occasions. These women traditionally pass on their roles the same way promesas are passed on, and it is their prerogative to decide who to hand it on to. Traditionally that happens within a family line, unless that family’s younger women have moved from the village or can no longer carry it out, in which case it is passed to another line of women. One clan of women has long had this role in the cathedral, and the same is true in many villages. 1. The other Mariana islands — Saipan, Tinian, and Rota — form a separate political entity, the Commonwealth of the Northern Mariana Islands. Northern Mariana Islands and Guam are both U.S. territories, but in the process of establishing their modern political identities decided to do so separately. The Northern Mariana Islands have a similar Chamorro and Spanish history through 1898, but control and large-scale colonization by Japan from 1919 through World War II gave it a different history. In World War II many Saipanese sided with Japan, something Guamanians could not forget. Guamanians rejected a chance to merge all the Marianas into a unified Chamorro polity, establishing themselves as a territory distinct from the Northern Mariana Islands, despite other similarities of history, language and culture. 2. Guam is often included among the vast swath of islands designated geographically, rather than politically or culturally, as Micronesia. Here, the term Micronesia is used to refer to the islands that are formally united as the Federated States of Micronesia. 4. Francis X. Hezel, S.J., When Cultures Clash: Revisiting the 'Spanish-Chamorro Wars' (Saipan, M.P. 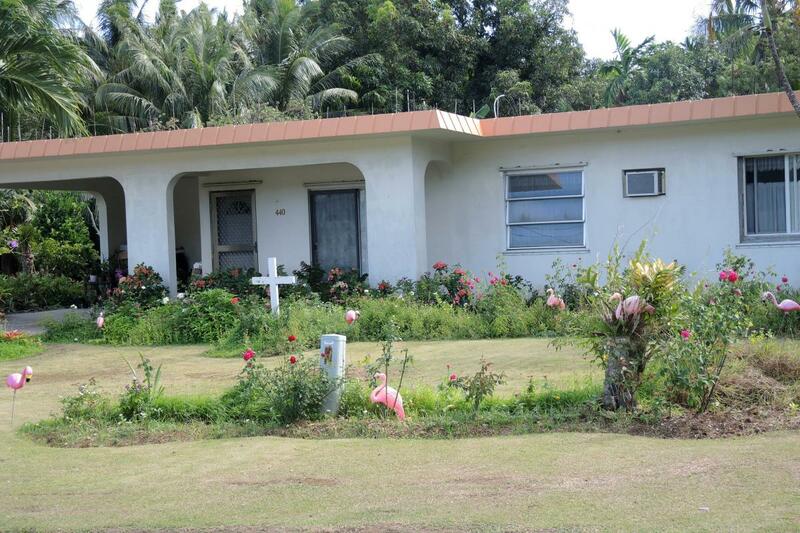 : Richard F. Taitano Micronesian Area Research Center, University of Guam, 2015) 12. 6. One accessible reflection on Chamorro history and Catholic identity, Pale’ (Father) Eric Forbes’ documentary video, “I am Chamorro” (2016) aims to foster a renewed sense of Chamorro identity for the people of the Marianas, especially Guam, even as it deals with the complexity of that identity and its changing nature over time. See https://www.iamchamorro.com/. 7. In addition to the sources cited here, the articles on Guam are the product of 14 extended interviews and many more informal conversations during two research visits in March and December 2017. Particular thanks are due to Rev. Fran Hezel, S.J., who provided a range of contacts and served as a gracious host. His own publications and expertise are well-known and respected in Guam. 8. This interviewee was comparing the situation to that of the island of Chuuk in the Federated States of Micronesia, but it would hold true compared to many Micronesian islands. This is not to suggest that Americans don’t value parental respect, but Americans are more likely to stress that it is the parents’ obligation to “let go” of children, for each to have space to develop in his own way. 9. Interviewees insisted that a promesa was different from what Filipinos call a panata, but despite many inquiries the difference has been elusive. Given the shared Spanish colonial heritage, it is easy to suggest that they are the same, but the difference in names is at least curious.